This strength of this book is all the things it leaves out (How-To tips) and the one thing it says we must do (more on that later). Kevin DeYoung is a clear, humorous, self-effacing, honest and transparent. He seems like an intelligent, normal guy. 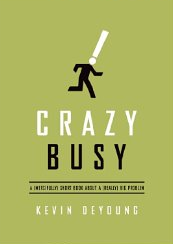 Writing as a pastor, he deals with the spiritual dangers of busyness. He is not writing a “How To” manual. His outline is simple: three dangers to avoid (2), seven diagnoses to consider (3-9), and one thing you must do (10). Here are some ways this book can help you. Let’s face it: people feel sorry for us when we’re busy. If we get our lives under control, we don’t seem nearly so impressive and people won’t ooh and aah over our burdens. Many of us feel proud to be so busy, and we enjoy the sympathy we receive for enduring such heroic responsibilities. Too often hospitality is a nerve-wracking experience for hosts and guests alike. Instead of setting our guests at ease, we set them on edge by telling them how bad the food will be, and what a mess the house is, and how sorry we are for the kids’ behavior. We get worked up and crazy busy in all the wrong ways because we are more concerned about looking good than with doing good. So instead of our encouraging those we host, they feel compelled to encourage us with constant reassurances that everything is just fine. Christ hospitality has much more to do with good relationships than with good food. Along with some of the advice I’ve gotten about pastoral ministry: make sure you do a few hours of counseling a week…working to develop leaders…doing one-on-one discipleship…do a few hours of evangelism…reserve a half day for reading…spending time in Greek and Hebrew. Who is sufficient for these things? Solution: “We have to be okay with other Christians doing certain things better and more often than we do.” Here is where John Frame’s arguments freed me from ministry guilt. Just because God has give us commands doesn’t mean He has given us unlimited time. He understands our finitude. He expects us to know our calling, embrace our strengths, and prioritize His commands. 4. For Parents: Kids gave their parents high grades for making them feel important and attending events but very low on controlling their tempers. Children are suffering from “second hand stress.” The way to have a better life and a bigger family is by doing less. What is interesting here is that DeYoung (a PCA pastor) acknowledges the common plight of Christians with unbelieving and wayward children, a different perspective taken by another Presbyterian pastor I addressed yesterday. We want to complexify our lives. We don’t have to, we want to. We want to be harried and hassled and busy. Unconsciously, we want the very things we complain about. That is, we buy the lie of the digital era that we can be omini-competent and omni-informed. But we must choose our absence, inability and ignorance wisely and only then will we be free. DeYoung offers nothing profound, just a lot of common sense. He doesn’t try to give us a list of ways to make our lives less crowded, just one goal that crazy busy people should have: make it your resolute goal to spend time every day in the Word of God and prayer. With this in place, our diet, entertainment, sleep and priorities would more easily fall in place and the world would become less crazy busy. This is such an excellent review; thanks for sharing. The quotes on motherhood, family, and the solution especially motivated me.